Bike Bloc is a large group of individuals and cycling affinity groups similar to a Critical Mass ride. Bike Blocs at street protests have the advantage of being able to break up and reform. 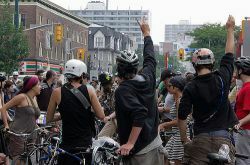 The spontaneity of a Bike Bloc means that participants are able to easily move through the streets without the needing leaders or a decided route. Another advantage of a Bike Bloc is that arrests are rare and a generally festive atmosphere. In the past, Bike Blocs have provided a tremendous amount of solidarity and logistical support to demonstrators who are on foot. Please meet with your bikes at the gazebo in Strathcona park 4pm. The ride will end with a vegan community dinner at the Russian Hall at 5:30pm. This workshop will kick off No Pipelines! : Action Training for Climate Justicehappening for the weekend of April 4th, 5th, and 6th.